Saturday, 5 December 1981 - the last time Derek Elston missed a Swindon Town match. Since then, he has made six trips to Wembley, seen six promotions and seven relegations - shrugged off knee operations and taken a water bus to ensure he has not missed a game. Elston's remarkable run started with an FA Cup second-round win over Sutton, and his 2,000th game in a row came on Sunday at the same stage of the same competition - but this time the League Two Robins lost to sixth-tier Woking. But perhaps the most astonishing thing is he has never lived in, or near, Swindon - having grown up in Watford and latterly moved to Northampton. So how did this unlikely love affair begin? "My parents had friends that lived in Chiseldon, just outside Swindon. I always had interest in trains and Swindon was the main works on the Great Western Railway, so I chose them. "The first game I got to was in 1967 - I was on something like £4.50 a week as an apprentice, so games were very few and far between." 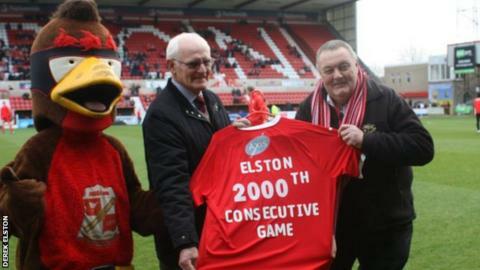 Retired auto-electrician Elston, 68, was presented with a shirt and cakes to celebrate the milestone, but his match-going streak nearly came to an end less than three years after it started. "In 1984 we got relegated on the final day of the season at Newport. I was absolutely devastated, and me and my friend never spoke a word all the way home," he said. "When we got back he said 'see you next season' and I said 'no, I won't be going again' - but of course I did." Trips to Ascoli and Venezia in the Anglo-Italian Cup, a chance to see "incredible" player-manager Glenn Hoddle in a Swindon shirt, and a season in the Premier League were rewards for his loyalty. Elston has programmes from all 2,000 games - with a pin-badge collection of at least 7,000 - and has seen Swindon play home and away against every side in England's top four divisions. "I never set out to do this, it just happened. It's just what I do - I go to the football every Saturday and Tuesday," he says in a matter-of-fact way. "As long as I'm fit, able and enjoying it I'll still go." With a 140-mile round trip just for a home game, Elston will be pleased his beloved Swindon are just down the road from him at Northampton on Boxing Day.